WASHINGTON (CNN) -- The Obama administration will scrap the controversial missile defense shield program in Eastern Europe, a senior administration official confirmed to CNN Thursday. The U.S. has been testing the ability of ground-based interceptor missiles to hit long-range ballistic missiles. The comment followed similar statements from officials in Poland and the Czech Republic -- where key elements of the system were to be located -- but was the first confirmation from an American official. Vice President Joe Biden earlier refused to confirm to CNN that the George W. Bush-era plan was being shelved. But he did explain the logic of doing so, saying Iran -- a key concern for the United States -- was not a threat. "I think we are fully capable and secure dealing with any present or future potential Iranian threat," he told CNN's Chris Lawrence in Baghdad, where he is on a brief trip. "The whole purpose of this exercise we are undertaking is to diminish the prospect of the Iranians destabilizing that region in the world. I am less concerned -- much less concerned -- about the Iranian potential. They have no potential at this moment, they have no capacity to launch a missile at the United States of America," he said. The Bush administration had cited the perceived nuclear threat from Iran as one of the key reasons it wanted to install the missile shield in eastern Europe. The U.S. reversal is likely to please Russia, which had fiercely opposed the plans. A U.S. delegation held high-level meetings Thursday in both Poland and the Czech Republic to discuss the missile defense system. While the outcome of the meetings wasn't clear, officials in both countries confirmed the system would be scrapped. Czech Prime minister Jan Fischer said in a statement that U.S. President Barack Obama told him in a Wednesday phone call that the United States was shelving its plans. Fischer did not say what reason Obama gave him for reconsidering. A spokeswoman at the Polish Ministry of Defense also said the program had been suspended. "This is catastrophic for Poland," said the spokeswoman, who declined to be named in line with ministry policy. U.S. Defense Secretary Robert Gates and Gen. James E. Cartwright, who is vice chairman of the Joint Chiefs of Staff, are scheduled to hold a news conference Thursday morning. The Defense Department has not announced what will be discussed, but Cartwright is the point man for the missile defense shield program. Poland and the Czech Republic had based much of their future security policy on getting the missile defenses from the United States. The countries share deep concerns of a future military threat from the east -- namely, Russia -- and may now look for other defense assurances from their NATO allies. "At the NATO summit in April, we adopted a resolution focusing on building a defense system against real, existing threats, i.e. 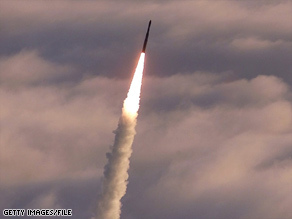 short-range and medium-range missiles," Fischer said. "We expect that the United States will continue cooperating with the Czech Republic on concluding the relevant agreements on our mutual (research and development) and military collaboration, including the financing of specific projects." By contrast, Russia may view the move as a diplomatic victory after complaining about the program consistently for years. There was no comment Thursday morning from Russian officials. But the issue has been a sore point in relations between Washington and Moscow, with Russia believing the shield would ultimately erode its own strategic nuclear deterrent. With the program scrapped, it opens the way for Russia to join with the United States in taking a harder line on Iran, CNN Correspondent Matthew Chance reported from Moscow. The United States proposed the plans under then-President George W. Bush, but since taking over this year, the Obama administration has been reviewing whether to move ahead with them. The missile shield issue came up in July during a meeting between Obama and Russian President Dmitry Medvedev in Moscow. Obama maintained that Russia had nothing to fear from such a system, which would be designed to intercept a solitary missile from Iran or North Korea, as opposed to "a mighty Russian arsenal." CNN's Suzanne Malveaux in Washington and Per Nyberg in London, England, contributed to this report.